The eye doctors at Northwest Indiana Eye & Laser Center offer evaluation and diagnosis of floaters and flashes. Floaters are an eye condition that can be an annoyance and may even be frightening. Floaters may appear as tiny specks or “cobwebs” or as small dark shadows, “thread-like” strands or even “squiggly” lines that actually float around in your field of vision. They tend to move as your eyes move, but not necessarily in the same direction, and often just drift away when your eyes stop moving. 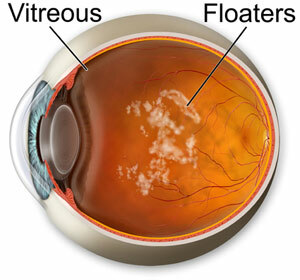 Generally, floaters are a normal and expected consequence of the aging process of your eyes. In most cases, if left alone, they will “settle” and no longer be annoying. Most patients are able to simply ignore their presence unless they become greater in number or prominence. Typically they become more noticeable when looking at a visual field with a white background such as a plain piece of paper or a clear blue sky. The “back of the eye” is filled with a gel-like substance called the Vitreous. As we age, the normally gel like Vitreous tends to shrink and become somewhat “stringy”. 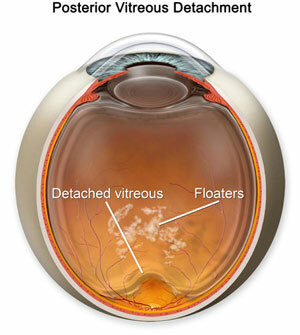 These strands of Vitreous can actually cast shadows on the retina and creates the appearance of floaters. The likelihood of experiencing floaters increases as we get older and is more common if you are very nearsighted or have diabetes. Sometimes other eye conditions or problems inside the eye may cause floaters such as infections, inflammation, hemorrhages, retinal tears or trauma to the eye. Occasionally, a small section of the Vitreous gel may pull away from the retina all at once instead of slowly and gradually, resulting in a noticeable and sudden increase in the number of floaters that you see and can be frightening. This is called a Posterior Vitreous Detachment (PVD) and is NOT sight threatening. However, if light flashes or a distortion or a decrease in your side vision accompanies it, it could be a Retinal Detachment, which is a sight threatening medical emergency. If you experience any of these symptoms you should call Northwest Indiana Eye & Laser Center and tell the receptionist or doctor on call that you need an appointment immediately. After a thorough dilated eye examination at Northwest Indiana Eye & Laser Center we will be able to diagnose whether your floaters are part of normal aging or due to a more serious and possible sight-threatening problem. If the flashes and floaters are simply a sign of a PVD, and no other problem is present, then no treatment is necessary. The flashes are likely to go away on their own within a few days or weeks. Floaters may take weeks or months to diminish, and may not completely go away. With time, floaters will become less apparent as the mind adjusts to their presence.